“Beer has dispelled the illness which was in me.” in Egyptian hieroglyphics is part of the mural composed by design great, Milton Glaser for the Brooklyn Brewery. As the brewery got set to expand its headquarters more than 10x, we were hired to tattoo and distress an interior logo on the new brewhouse walls as well as paint a bright exterior mural. Not only did we paint the outside wall, but we were in charge of prepping it, from chipping off old paint layers and sealing it with cement to creating what was coined the “papyrus” effect in order to camouflage the background with the rest of the old building. The texture was made to be as smooth as the rest or well, as bumpy… we always seem to get the best surfaces to paint on. Still, the entire process took off without a hitch. The colors in the hieroglyphics themselves are the actual type of colors one can find in an ancient Egyptian tomb. The quote is in fact, a saying from one of these tombs or monuments. The original logo, also designed by Milton Glaser, was placed so that it would be slightly offset on the building but still easily recognizable. 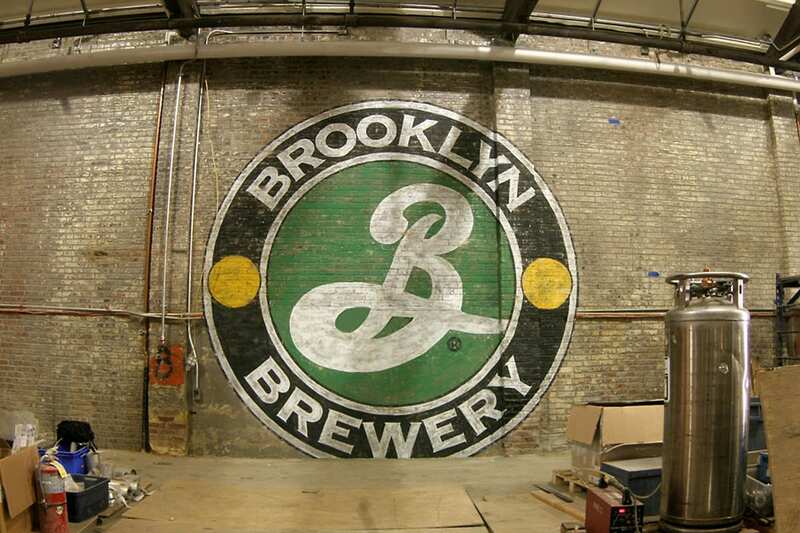 Located in Williamsburg, Brooklyn, the Brooklyn Brewery is a main stay of the community and visited by many of the hip locals and beer loving tourists. The block itself has developed twenty-fold since the Brewery rooted there two decades ago, helping to define the area. Now on the same street, stand large hotel, BBQ joint, bars, thrift store and other crazy Williamsburg type of stuff like the bowling alley/music venue/fancy fried chicken spot; goodies and vices that would help dispel those illnesses within us.